Your intranet is an ecosystem that maintains a three-way balance between people, technology, and process. Naturally, your people are the aspect that deserves the most attention and energy as they can make or break both your technology and your processes. This means that you firstly and fore mostly need to ensure that you are in a position to align all three aspects of your digital ecosystem – starting with people. So before embarking on your new intranet journey, start with the people at the top; ensure that you have executive sponsorship and support. Of course, this is something that has been emphasized and written about steadily as being paramount to your intranet’s success. For all intents and purposes let’s assume that you have your executives on board before we begin our process. (But if you don’t we can help there, too). Firstly, it’s important to define your audiences depending upon the size and structure of your organization. Break down your organization starting with existing silos. This can be by departments, offices, regions, or even operations. Are there portions of the workforce that won’t rely on the intranet at all (e.g. manufacturing, wage staff, etc.)? On the other end of the spectrum, you may also look at the information and/or areas of the intranet that most employees need. These may include various types of communications, different applications, tools, and even separate portals – each of which may have individuals or teams supporting them whose needs must also be understood. With audiences defined, you may then tap into various groups and teams using a number of different methods. Some of these methods may include polling users, interviewing management, or conducting focus groups. When engaging with various representatives of your user groups, it is important to gain an understanding of what is important to them. What tools are they using? What communications content is valuable? Does the corporate culture differ for different groups? How is the existing intranet lacking? What future needs can the intranet address? There are even some areas of your organization where you may find that things are working just fine, at which point you either need to probe a bit deeper or simply focus more on the audiences that need it. You will be pleasantly surprised what you may learn when looking at various portions of your organization through different lenses, and especially in the context of the intranet’s technology and processes. From this, a solid understanding of the current intranet’s faults can be adequately captured, and more importantly, your key requirements for improvement on your new intranet. It just takes a little bit of digging and a lot of analysis. Knowing your audiences provides a great foundation for understanding where your intranet is today, and where it needs to be tomorrow. But of course, priorities need to be assigned to the collections of requirements and desires for the future intranet. Should Marketing have more of a say or Sales? More importantly, once the new intranet is up and running, who is going to be needed to keep it afloat? Of course there’s always going to be IT development and support, but what about the other company processes that will be intertwined (e.g. Training, Payroll, Communications, etc.)? Knowing the needs of your audiences will help you understand where and how the intranet will play within your organization. In short, your intranet should have strategy and governance plans in place. This step must never be over-looked, unless you want your intranet to fail within a relatively short period of time. 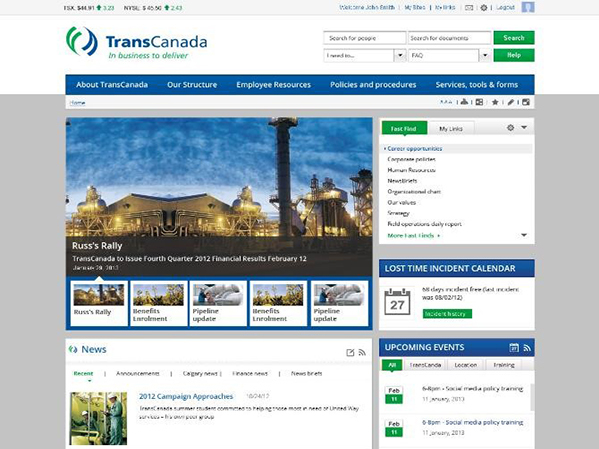 The intranet’s strategy is essential as it ties the intranet to the organization’s performance and success. How well aligned is your intranet’s vision with the organization’s directives? If the company’s priority is to sustain market leadership, then how the intranet will support that directive must be specifically noted. That way, you can measure its success – which is vital. This also paves the way to prioritizing what features will provide the most value on the new intranet. You may then invest resources to focus on specific features, such as knowledge sharing and collaboration as a key driver for organizational success. This will also ensure that all stakeholders are on board, and that the support continues for the intranet as it evolves over time. Governance is assigning roles and rules to the intranet, and is essential to uphold accountability and establish a solid internal support network. This includes creating steering committees, a dedicated intranet owner, editors, and IT personnel to ensure the intranet’s ongoing success. These intranet-related tasks should become a part of each member’s job description. In addition, the development of policies that define the appropriate terms and use of the intranet should also be put in place and enforced. The intranet will then have an active body of people and supporting processes behind it. Beyond the technology itself, will be the intricacies of setting it up in a manner that works for you and your organization. With the people and process in place, now is the best time to select the right platform, applications, tools, etc. to drive a successful digital ecosystem. This may include integrating existing systems wherever possible, but this further helps to assess and select various technological options, should you be in the market for new software and service offerings. While modern web design may ascribe to the ‘three-click rule’ as best practice, this simply isn’t the case for intranets. Your organizational content may require more than three clicks to access, and that’s okay. What’s more important is knowing what should be available within a few interactions and bringing it as close to surface as possible. The best way to do this is to rethink your information architecture. How well has content been grouped, categorized, and tagged? Very often, especially as intranets grow over time, information can be segmented (or “silo’d”) by functional area or department. But that can have very negative effects on important facets of the intranet such as governance and content management. Instead, try revisiting the content groupings with the intention to simplify where the different types of information live. This also means being able to characterize your content in multiple ways; a form, a policy, a web resource, a video, an announcement, a discussion, an article, etc. as well as by organizational function. Ensuring that this metadata is captured, and that the appropriate content and sections are characterized and tagged improves more than just the user experience. The more thorough of a content audit you conduct, while it may be time or resource-intensive, will ensure seamless content migration and intuitive organization on your new intranet. Whether or not you know what technology or platform upon which your new intranet will be based, you are still able to generate wireframes of your key intranet page components. You now have the knowledge of what user-experience challenges can be overcome, what information is to be prioritized, what features and functions will drive value for the business and for users, and how your content should be organized. With this, you may now illustrate how you would like key areas of your navigation scheme to appear, including landing pages, and your top-priority areas. 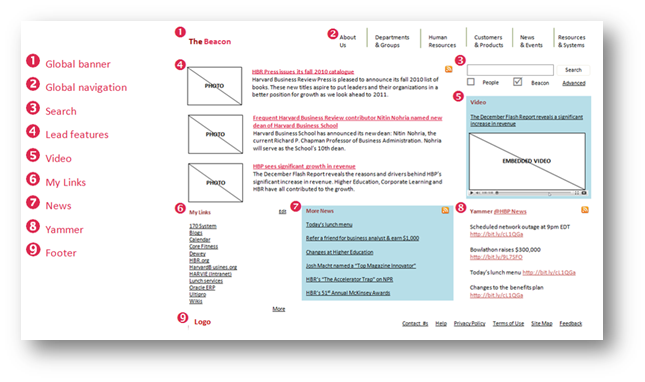 You can start with generating wireframes to show a basic skeleton of how information will be positioned (as pictured above). You may then add certain branding and design elements as you see fit to show what the site page may actually look like. If you want to go a step further, you can code the design pages to that they can contain links, and basic feedback notifications in order to simulate the look and feel of the real, live intranet. You are welcome to push the concept stage as far as you feel confident, as long as you’re obtaining validation along the way. It is crucial to gain feedback from your stakeholder groups before moving forward into implementing the concept. This may be done by presenting to various steering committees, focus groups, and by conducting usability tests to capture reactions and suggestions throughout your user audiences. Once approval is obtained, you may then move into the implementation phase. It is important to keep in mind that your current designs are more than likely just a template that other designs will need to be based on. So regardless of your implementation phasing and strategy, be sure to capture the appropriate branding and design guidelines to be used throughout the new intranet. This may include the color palette, use of logos, fonts, spacing, page templates and other preferences. This is truly important for ensuring a consistent, unique, modern look and feel within your new intranet and as it evolves over time. Keeping in mind that your organization is unique, there may be some areas outlined within this process that may already be defined – such as an existing governance model, or your uses of technology. Regardless of your situation, it is important that you devote attention and resources towards activities within each of these steps to adequately ensure the balance between user audience needs, business processes, and your digital ecosystem / technological capabilities. This will not only ensure that you have a well-functioning and engaging intranet, but will also serve you well during implementation, change management, and related phases of launching your successful new intranet. These master ingredients will be front-and-center and showcased by some of the World’s best intranets – from GM to Coca-Cola, Microsoft and Liberty Mutual – at this the 2019 Digital Workplace & Intranet Global Forum conference in New York. Reserve your intranet conference seat now and bring a colleague for 50% off.